I am in Superior, Wisconsin today for work. A group of artists and business people are interested in creating an art district in downtown Superior. This morning, I will be having coffee at the Red Mug Coffeehouse - one of Superior's most interesting venues for art, music, and baked goods. Artist Carla Stetson installed Wrapped at Red Mug Coffeehouse in 2006. You know I love a wrapped tree. Vivian Springford (1914-2003) Martinique Series (VS5), 1974, acrylic on canvas, 89 x 88 in. My perfect birthday started with breakfast at Echo Lake Cafe with my sister, Kari and my husband, Mike. An anonymous caller phoned in a carrot cake muffin and an order of birthday huevos rancheros, "on the house." We spent the day in Glacier National Park, making our first stop at Lake McDonald. We continued with a four mile walk along Avalanche Gorge. In the summer months, the three of us would turn up our noses at this tourist path in favor of something more challenging. Something longer and higher. But in the peace and quiet of spring, Glacier's Avalanche trail is a great way to see the snow melt rushing down into the river. The water has smoothed the rocks into gentle canyons over hundreds of years. We hung out and enjoyed Avalanche Lake. Everyone was outside enjoying the warm sunshine. There were birds. Thank you so much for all of the lovely messages on email, Facebook, and Twitter! It made my day to hear from so many good friends! Refnaes, originally uploaded by unionpearl. Ancestors are often remembered for some small incident. My grandma used to tell me how her mother, my great-grandma, could knit and walk at the same time. She would knit a mitten as she covered the miles to her sister's farm. On the way home, she'd knit the thumbs. Tanneries, originally uploaded by oliverlaumann. Men working in Morocco's tanneries go feet first into centuries-old vats of dye. Love is over, originally uploaded by absentbabinski. Everything I learned about "love" in elementary school was informed by our monthly outings to the roller rink in Pontiac, Michigan. I watched the sixth graders carefully to gather information. This early fieldwork led me to the conclusion that, someday - once I was finally old enough to wear that stretchy gold belt with the lion head buckle- a boy would give me a Speidel Ident bracelet engraved with my name. Maybe even the one that had a secret compartment to hold a picture of the two of us, "couples skating" to eternity. The Speidel Ident never happened for me. Did it happen for you? It's amazing how many performers have recorded this song with Kermit. Each artist creates their own impression of this beautiful piece. Tony Bennett's beautiful duet with Kermit makes me sad. Ray Charles with full muppet backup. This version, with Lena Horne, isn't as sad, and Kermit is totally emotional with her. But nothing really compares to how Big Bird did it in St. John of the Divine, for Jim Henson's funeral. The Inari shrine in Kyoto, Japan. 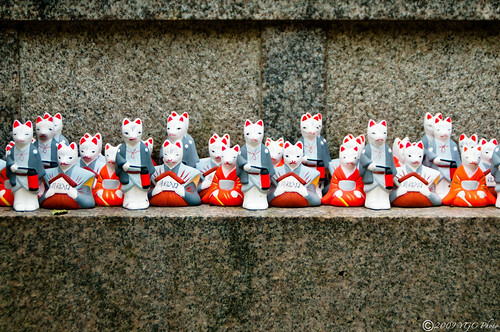 For Shinto Buddhists, fox is a messenger between good and evil. Sluts and Studs (detail), originally uploaded by Nava Atlas. 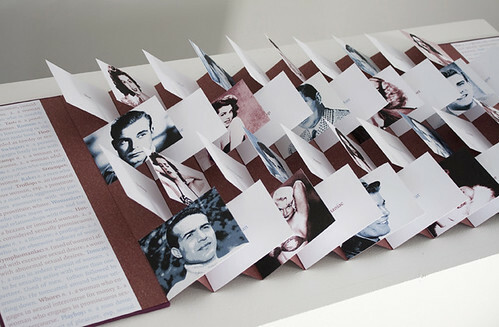 I love artist books - its more difficult than you might think to create one. I've never managed to achieve that incredible combination of playful structure, engaging text, and divine visual. It takes planning, anyway. See more of Nava Atlas' artist books and "readable objects" on her website. Sharon Montrose sells prints of her animal portraints on Etsy. Click on the image to get the full effect. I love the arch and stretch of the macaw's wings in this photo. The color of his feathers against the studio white is amazing. And I love that he has his back turned. But I think the goat stole my soul. 1947. After a decade of short skirts and rationed fabric, Dior made a skirt that came to define the silhouette known as the "New Look." A full skirt with an impossibly narrow wasp-like waist. Yards upon yards of fabric was sewn into knife pleats over a heavily padded underskirt. This dress, "Cherise", used THIRTEEN YARDS of silk. 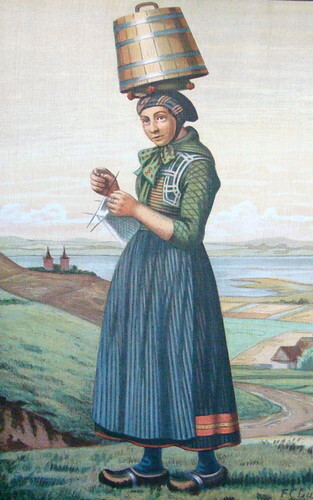 Some "New Look" skirts used nearly twenty yards of fabric. Imagine the weight. And the time. Can you see all those tiny hand stitches at the waist? Knife pleats like feathers. Ryan Hyde came up with the idea for the book after two men helped put out a fire in her car's engine block. In shock,she just sat in the vehicle, watching the smoke pour in from under the dashboard, scared to get out of the car in the middle of the night in LA's Echo Park neighborhood. Ryan Hyde recounted how she saw the men approach her vehicle, one carrying a blanket. She had every expectation that she would be hurt by these two strangers. What unfolded would change the direction of her entire life. The men used the blanket to put out the fire, and had already called the fire department. They helped. In the resulting confusion, of fire trucks, tow trucks, and police reports, the two men left without giving Hyde a chance to thank them for saving her life. The need for closure eventually led to the idea for the Pay It Forward campaign - instead of "repaying" a good turn, you can pay it forward to someone who needs your help. Ryan says that when you have received something - whether it is a great or small effort on the part of the giver - it will then be much easier for you to give something to someone else. In the lecture, the audience also talked about how the principle works in the negative. The media often recounts how a child raised by an abuser will grow up to abuse others. For me, this example (though I know it can be true) is extreme. What troubles me more is the role modeling that happens in the "middle" space. The everyday acts of emotional violence that people act out on one another that, by society's standards, are just a "normal" part of life. Things children are supposed to learn to cope with - emotional blackmail, teasing at home or at school, parents who withdraw their "love" if you don't do the right thing or parents who cling to their children so they don't have to be alone. Parents who project their addictions or disappointments onto their kids, teachers and caregivers who look the other way. Adults who feel compelled to point out their friends' weak spots in front of everyone, who can't seem to forget things that are better left in the past. Even those who mean well get easily overwhelmed by the need in the world and put up the blinders to the needs of others. By coincidence, I have been reading a very good book by Harville Hendrix called Keeping the Love You Find. It's a very thoughtful book about how the love you experienced in childhood influences the way you give and receive love as an adult. You see, one of the things I had been noticing about myself - it will probably seem funny to you - is that whenever I do yard work, I become extremely anxious. For the first three years of country life, I wouldn't work outside at all. Finally, I decided to help out but only because I "needed the exercise", but I still second guess my decisions about where to put the leaf piles or whether or not I should really pick up the dead sticks myself or wait for Mike. I enjoy the work if I am with Mike but if I'm alone, there is this whole worried conversation going on in my head about whether or not I'm raking "properly." I realized one day that I am WAITING FOR MY FATHER TO COME OUT AND YELL AT ME as he often did when I was a kid. Obviously, this was not the "normal" yelling of a "normal" parent. Maybe yard work seems small, but Hendrix argues that certain consistent behaviors at certain times in a child's life can dramatically alter kids' perceptions about their self-worth. Inconsistency can disturb a child's emotional development event more. Catherine Ryan Hyde said something like this in her talk. The way we perceive ourselves and the power we have in the world is "talked into us, yelled into us, you learn quickly what not to say." And it informs the rest of your life. Thought for today: How we treat each other matters. How we treat each other in front of kids matters. How we treat kids matters the most.